These are my gleanings from the meeting held at the Barceló with ADI (Association de Desarollo Integral), SINAC (Sistema Nacional de Areas de Conservacion), CATURGUA (Camera de Turismo Guanacasteca), and MINAE (Ministerio de Ambiente y Energia). The purpose of the meeting was to discuss The Crocodile/s . I mostly went to listen, because that’s always a good start, and I got to ask a few questions. What follows is what I took away from the meeting. This is not intended to be a complete summary—I’m sure ADI will provide that. It is a subjective gleaning and contains editorial commentary and a concerted effort to minimize sarcasm. –They carefully observed the crocodiles in the estuary after the July attack. They removed the very big one that exhibited dangerous/unusual behavior, explaining that there was only one exhibiting this behavior and it is certainly the one guilty of the attack. It was taken to Puerto Humo. (I looked it up. It’s where the Tempisque River is born. ) 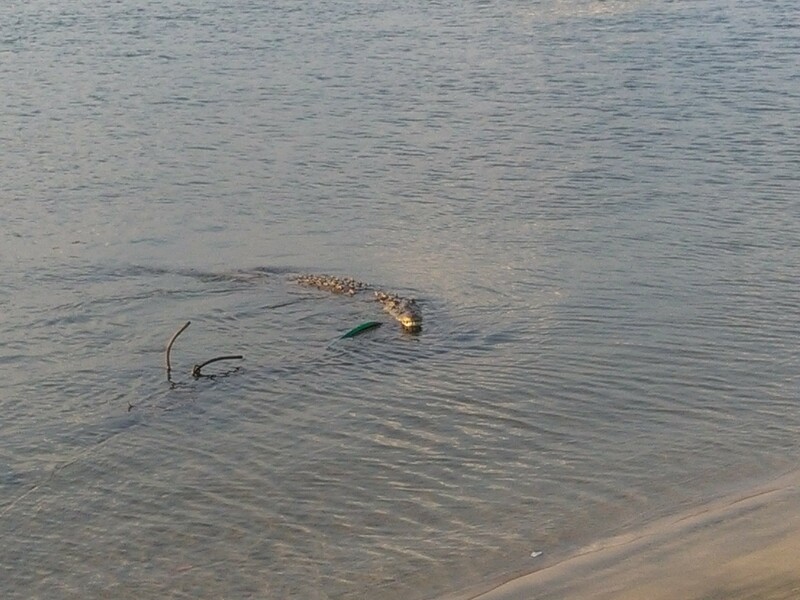 They are still monitoring crocodiles in the Playa Grande/Tamarindo/Langosta area and analyzing their behavior. In the five kilometer marine stretch that they monitor, it is normal for there to be 12-14 crocodiles moving around at any given time. –It is not true that crocodiles were “seeded” here. –Salt water crocs are completely natural in the estuaries and oceans of Guanacaste. She says they were depleted in the 40-60s, but that now their populations are becoming “healthy” again. –It is not true that there is an overpopulation of crocodiles in Tamarindo. Overpopulation occurs when there are so many of a species that there is not enough food for them, and they begin to kill each other. Since crocodiles are not doing this, there is no overpopulation. Lucky for us, crocodiles are of a species that control their own population—as in, crocodiles never have overpopulation because they kill each other first and solve their own problem. –Attacking/eating (presumably adult) people is not normal behavior for this species of crocodile. Nile crocodiles, she explained, eat people, but not this kind. She made a big deal about how crocodiles do not hunt people, do not want to eat people and are normally afraid of people. –The (only) problem in Tamarindo is that crocodiles have been, for so long, fed by humans. The SINAC guy talked too, but he didn’t say anything that stuck with me. He did take a moment to praise the fact that we have such a wonderful government system that allows us all to participate in decisions, as demonstrated by this meeting. But ok. So we’ve corrupted the crocodile population. While we right our wrong, what’s the plan for our safety? They said they are monitoring the crocodiles by observing them. I was imagining chips and tracking devices, but no. That’s way too Animal Planet. “Monitoring” means that MINAE has people watching over the crocodiles. (I haven’t seen these monitors. Maybe you have?) Later in the meeting MINAE stated that they have 7 people in charge of “monitoring” 26,000 hectares. Or maybe I misunderstood that? I hope so. And a naughty crocodile, one who could get itself on the bad-boy list for possible deportation to Puerto Humo, is one that shows abnormal interest in people. Swimming near people. Looking at people. Not humbly slinking away. MINAE wants us to report to them—that’s the most useful thing I learned at the meeting. If you see a human feeding a crocodile, make a denuncia. If you see a crocodile showing interest in humans, make a denuncia! (I’m not sure it’s called a denuncia if it’s against an animal, but you get what I mean.) MINAE says that for all of the videos on social media and for all the fussing and fuming there is about people feeding crocs, there has not ever been ONE SINGLE denuncia filed against anyone with MINAE. Which is silly. A few denuncias, a long time ago, would have enabled them to act before things turned out the way they did. Or anyway, that’s the story in retrospect. Point being: if you see any funny stuff between people and crocodiles—regardless of which species is the perpetrator—call MINAE. They’ll be right over after they finish observing the other 25,000 hectares they’re in charge of. I asked my other question to Laura The Crocodile Expert. Because I wanted someone at that table of “experts” to say it to my face. I said, “You’re the crocodile expert. You know these animals better than anyone else in this room. So tell me. Now that the big bad crocodile is gone, but knowing that there are others nearby who were certainly fed by humans, would you , if you were a surfer like I am, put your board in the water and surf in the mouth of the estuary?” Everybody laughed nervously. And Laura said, “No.” Not in the mouth of the estuary, she wouldn’t. No matter how good the waves were. That’s like chilling out on their buffet table. People surf in the river mouth every day, and so far all of us have been safe. I didn’t say that, because she gave me her honest opinion, which is what I asked for. And she confirmed that my persisting fears are not an irrational. Now, looking back on it, I feel a small (but futile) twinge of victory. I didn’t mean to set a trap, but if you think about it, I guess the panel of experts admitted that even though they’ve “done something” about the crocodile “problem” in Tamarindo, it still isn’t “safe.” Babies, dogs and surfers, beware: MINAE is working to protect us within the bounds of the law, but the crocodile expert wouldn’t go for a swim. I took this photo in April 2016, of a crocodile exhibiting “abnormal” behavior–chilling there staring me down. If it ever happens again, I will call MINAE. I don’t know what, unless I was simply supposed to be there, possessed me to get up at the crack of dawn and go down to surf the outgoing tide. I never do that. I don’t like surfing the outgoing tide in Tamarindo now, with the estuary dumping out its murky water practically at the Pico Grande reef. You can see from the beach why it would be better to wait a few days until the early tide is coming in, which is what I usually do. I live here. I can afford to be picky. But on Friday morning, I went anyway. In fact, it was late on Thursday afternoon when, for some reason, I decided to get up early and surf the outgoing tide in the morning, which I know perfectly well I don’t like. And as I might have expected–I didn’t like it. There were plenty of waves, but all swirly and weird, breaking funny like I’m not used to, and the murky water and smelled of the brackish estuary. The current was pushing me around, and I got a little freaked out about crocodiles. I know that the estuary is where they live, and I know that some of them are huge and tame. I tell myself all the time that crocodiles don’t eat people, but I declare I could feel their beady eyes on me. So I rode the second wave I caught all the way in to the beach and decided to go home for breakfast. The last thing in the world I expected was to end up assisting the victim of a crocodile attack. As I walked down the beach toward the path to the street, I saw something that didn’t make sense. My friend Edgar pulling somebody out of the estuary on the board. A child? No, not a child. A very big person. Something wasn’t right about the person’s face. Was that blood on it? And he wasn’t acting right. Edgar wasn’t acting right, either. I put my board down and asked, “Do you need help?” because something was wrong, but I couldn’t tell what. That’s when Edgar told me that a crocodile had just attacked the man as they attempted to across the estuary. They fought it until it let him go. Edgar ran for help and I went to the man. He was lying on a small surfboard, floating in a about a foot of swirling water. The was conscious and there were holes in his face. Big holes. He looked up at me and I knew there was no way on God’s green earth I could get a man this big out of the water by myself. I asked him if he could walk. He told me his right leg was pretty f*’d up. I asked him if he could crawl. He said he thought so. So I tried to help this large, terribly injured man crawl from the sea onto the land. His hands and arms were full of bites from crocodile teeth, already starting to swell. Then I saw his leg. It wasn’t a leg anymore. There was a foot, but it was no longer his foot. It was a foot with an ankle, floating, still attached to various types of flesh and a bare, jagged bone. I told myself not to look at it. As soon as he was completely out of the water, I told him to lie down. The tide was going out, like I said, and I knew the water would soon be far away. He rolled onto his back. And there I was on the beach with a mutilated man that I do not know, somewhere between life and death, sometime before 7 AM on a beautiful morning. I held his head in my hands and he breathed. I pulled Edgar’s board toward me and propped the man’s head on it. Then I took off the long-sleeved rashguard (which I only wear when I am trying to avoid sunburn, but for some reason put on that day at 5:30 in the morning), and tied it as tightly as I could above his right knee. I knew that the mess below it was not going to be of use to him anymore, but I also knew that he would bleed to death right there in the sand if someone didn’t stop him. Then I did the only other thing you can do at a time like that: I put my hands on either side of his head, held it lightly so he would feel there was someone with him, and prayed to God that he would not feel too much fear or too much pain. I thought he might die. I know that the human body is amazingly strong, but I didn’t know how much blood he’d lost or how long it would take for an ambulance to come. Or if they would have what he needed when they got there. I had a flashback of the man who died on the beach in Tamarindo years ago after a drowning incident because when the emergency team arrived to resuscitate him, no one had charged the defibrillator. Lots of guys arrived and started running around cursing, exclaiming, bring bandages and ice. I got up and walked quietly away. There was nothing more I could offer as more capable help began to arrive. That’s when I had to sit, for a minute, with my head between my knees and tell myself not to faint. I’m choosing not to describe in detail the mutilation that this man suffered. Even the nastiest pictures the media posted do not do it justice. Fortunately. He’s alive. His name is Jon. He is in the hospital fighting for his life as I write this, and winning. Of course–he beat the croc. He lost most of his right leg below the knee, but the rest will heal as long as infection is held at bay. Crocodiles are dirty creatures with dirty mouths and dirty teeth. I’m no authority on crocodiles, but do know it is normal for large reptiles to live in estuaries, where fresh and salt water mix. I do know that crocodiles swim in the ocean. I do not think they generally live in the ocean, but they certainly go out for a swim once in a while. I know that this crocodile (or these crocodiles, because they all look alike to me) lives in the Tamarindo estuary. I know that normally crocodiles live on fish, dead things, and small birds/animals that they catch. What is NOT normal is that this crocodile, or he and his cousins, like to hang out by the boats where people are. I’ve heard the boat drivers throw food to them so tourists can watch them eat. I have not seen them do that myself, so I am not saying it is a fact–although people I trust say that it is. This crocodile will let you walk near as it suns itself on the beach. I’ve seen people do it. It will come up out of the water onto the land where people are standing. In essence, it is not afraid of people, and that is NOT normal. And it is also not normal for a crocodile to attack a large grown man. I don’t understand why it would do that. We are not supposed to look like food to them. A dog, yes. A child, unfortunately, yes. A man the size of Jon? No. How many times have I joked that a crocodile wouldn’t want me because I’m too old and too tough to chew? Wrong. Every surfer in the world is aware that crocodiles live in estuaries, just as we know that sharks lives in oceans and stingrays sleep in the sand. It is a risk, big or small, that we knowingly take, at least to some degree. I used to cross the estuary on my board all the time, but since I’ve been back in Tamarindo I haven’t done it even once. I took one look at that croc when I got back into town and decided that the waves on this side will do just fine for a girl like me. Color me satisfied. Even that doesn’t make me safe, and that’s exactly my point: suffers make choices and are aware of at least dangers that fall within the realm of normal. That crocodile, in my opinion, is not normal. I worry about visitors. Tourists. People from San Jose or Santa Cruz. People from places like Kansas and Manitoba. People who have no idea. Children. I hear the authorities are putting up signs. Is that good enough? Jon and Edgar are big, strong men. They are both much bigger and far stronger than I am, and they were together as they fought this creature. I’ll be honest: I am full of fear. And this time it’s not fear of something I saw in a movie or dreamed in the night–it is fear of something I held in my hands. I know I will surf again, but not today. Today I will stand by the water and think about the ugly side of Mother Nature’s beautiful face. I will think about the necessity of a body full of warm blood, and how perfect it is to have two arms, two legs, one head. Today, that alone is enough of a thrill.